Performance review: The resources sector has performed poorly over the past five years. It has returned a negative 2.44% a year for the past 5-year, while financials and industrials have grown by 14.81% and 16.69% respectively. However, the resource index benefited from its exposure to the likes of Sasol, BHP and Mondi, which mainly performed positively over the 5-year period. Both ETFs have had a resurgence in the past year but Satrix RESI has grown strongly ahead of S&P Givi by 15.02 percentage points. 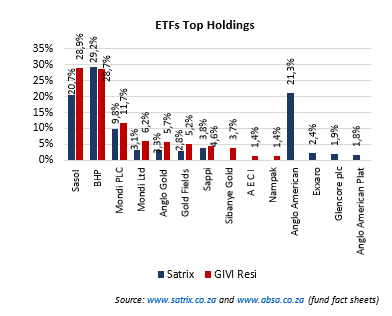 Even though the S&P Givi lagged in the past year, over the past five years it outperformed the Satrix RESI, returning an average of 13.9% a year against 2.9% for the Satrix fund. The noticeable differences in the historical performance of the ETFs and their benchmark is largely due to the different methodologies they use in selecting constituents. Satrix RESI, which has historically been the better of the two, selects its constituents based on their market capitalisation. Its benchmark invests in 10 largest resources companies, capped at 30%. The attraction of this methodology is that it reflects market performance, hence the fund increases its exposures to the 10 stocks that will be performing well at that time while avoiding those that are declining. 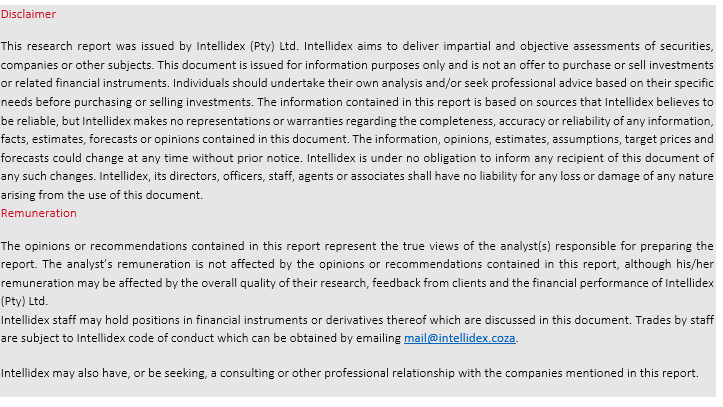 The S&P Givi selects its constituents based on what it deems to be the intrinsic value of the constituents, calculated on performance indicators. This is not directly linked to the share price performance of the stock. Outlook: Most local resources stocks are driven by the global commodities market and the rand exchange rate. Although global commodity prices have been recovering nicely due to a more synchronised global economic recovery particularly from Asia, recent trade wars have spooked investors and we are beginning to see price weakness creeping in. Commodity price recovery has been more pronounced in oil, coal and iron. On balance, the rand has weakened over the past decade and there are no real signs that it will recover significantly given both local and global developments. A weakening rand is generally positive for miners because they export most of their output. Top holdings: Both ETFs lack diversification: their top three constituents make up more than 70% of the funds. Thus, should the leading constituents drop in value, the funds’ returns will be badly affected. This diminishes the diversification benefits one usually obtains from ETFs. Suitability: These funds are aggressive, offering a blend of domestic and international exposure. Resource stocks tend to move in a cyclical nature in response to prevailing market conditions. They are suitable for long-term investors with an appetite for risk. Risk: Both funds invest in equities which is a riskier asset class compared with other asset classes such as bonds and cash. Most constituent companies export their output, so rand fluctuations affect the funds’ returns. Another potential risk is that two of the biggest constituents, BHP and Sasol, account for about half of the holdings of both funds, which leads to high concentration risk. Fees: The annual total expense ratio (TER) for the Satrix RESI is 0.43%, which is more than the Givi RESI at 0.24%.